Green Roof Benefits - Restoration Gardens Inc. Green Roof Benefits - Restoration Gardens Inc.
Green roof benefits are numerous, varied and far reaching! Read below to see how much green roofs will benefit you, the environment and your community. Extended roof life. Building up layers on top of your membrane protects it from the exposure to harmful extreme weather conditions and extends its life span, saving your money and the landfills. Reduced energy use. A green roof provides additional insulation and keeps the roof cool during the summer, reducing your cooling loads. Additional green space. Depending on loads and accessibility, some green roofs can provide additional green space in a cramped environment for an aesthetically pleasing perennial garden or for urban agriculture. Increased property value. A green roof can increase your property’s value by between 7-20% depending on whether it is accessible, produces food or simply adds greenery (Komorowski et al, ii-vi). Pleasing work environments. Studies show that employees who have views of green spaces experience greater work productivity. Increased urban biodiversity. With increased development, many species lose their natural habitats. Green roofs provide new homes for many birds, bees, insects and spiders, but don’t be afraid, they’re just interested in all their new food sources. Mitigation of the Urban Heat Island effect. In urban centres where there are many flat dark rooftops, the temperature can be a couple of degrees hotter than the surrounding countryside. This increase in temperature can be mitigated with the addition of green roofs. Reduced storm water run-off. As plants need water to survive, green roofs have minimal run-off compared to that of a traditional roof. This saves our over-taxed city storm water drains from overflow. Air filtration. Fine particles are captured on the leaves of plants and as rain falls, or plants are watered, these particles get washed into the green roof soil, thus making our air a little bit cleaner. 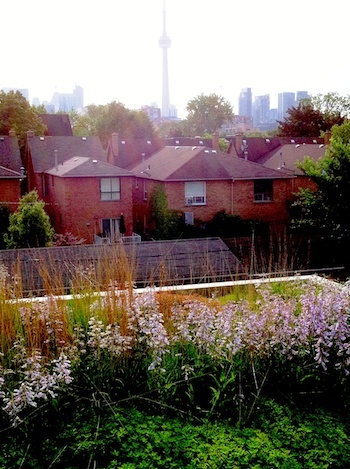 The City of Toronto recognizes all these benefits of green roofs, which is why they passed the Green Roof Bylaw in 2009. See our resources page for more information. Komorowski, Bartek and Ray Tomalty. “The Monetary Value of the Soft Benefits of Green Roofs” prepared for the Canadian Mortgage and Housing Corporation (August 2010).